This illustrated historical overview features some of the finest examples of Cherokee art in private, corporate, and museum collections throughout the world. As Susan C. Power ranges across the rich legacy of Cherokee artistic achievement from the sixteenth century to the present, she discusses baskets, masks, beaded and embroidered garments, jewelry, and paintings. Power draws on archival and scholarly sources and, when possible, the artists' own words as she interprets these objects in terms of their design, craftsmanship, style, and most important, their function and meaning in Cherokee history and culture. In addition to tracing the development of Cherokee art, Power reveals the wide range of geographical locales from which Cherokee art has originated. These places include the Cherokee's tribal homeland in the Southeast, the tribe's areas of resettlement in the West, and abodes in the United States and beyond to which individuals subsequently moved. Intimately connected to the time and place of its creation, Cherokee art changed along with Cherokee social, political, and economic circumstances. The entry of European explorers into the Southeast, the Trail of Tears, the American Civil War, and the signing of treaties with the U.S. government are among the transforming events in Cherokee art history that Power discusses. In the twentieth century, as Cherokee artists joined the mainstream art world, they helped shape the Native American Fine Art Movement. 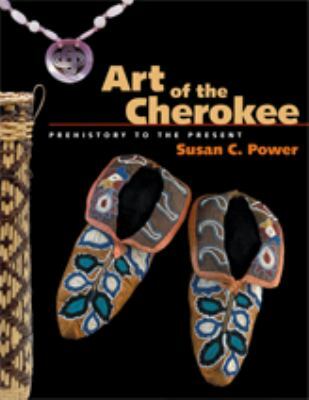 Today, Cherokee artists continue to create in an artistic voice that is uniquely Cherokee--a voice both traditional and contemporary.Power, Susan C. is the author of 'Art of the Cherokee Prehistory to the Present', published 2007 under ISBN 9780820327679 and ISBN 0820327670. Loading marketplace prices 238 copies from $28.63 How does the rental process work?